"Mafia Life: Love, Death and Money at the Heart of Organised Crime"
Federico Varese is a Professor of Criminology at the University of Oxford and a Senior Research Fellow at Nuffield College, Oxford. 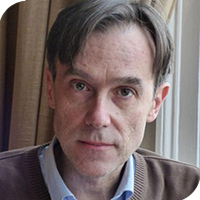 He has written on the Russian mafia, Soviet criminal history, migration of mafia groups, Somali piracy, the dynamics of altruistic behaviour, and the application of Social Network Analysis to criminology. He is the author of two monographs - The Russian Mafia (OUP, 2001) and Mafias on the Move (PUP, 2011). He has also edited the four-volume collection Organised Crime (Routledge, 2010). His work has been featured in The Economist, The BBC News & World Service, ABC, The Guardian, The New York Times, The Monkeycage Blog and Freakonomics blog, among others. Mafias on the Move was the Recipient of The International Association for the Study of Organized Crime 2012 Outstanding Publication Award. The Russian Mafia was The Co-Recipient, ED A. HEWETT BOOK PRIZE awarded by The American Association for the Advancement of Slavic Studies. His latest book, Mafia Life is being translated into seven languages and has been optioned for TV.